click here Go ahead and call it a dynasty. buy now For the second year in a row, and the third out of the last four, Patrick Henry High School will be the home club of the Division 21 Key Club Lieutenant Governor. viagra canadian pharmacy order At the Division 21 Conclave on Saturday, Jan. 12, PHHS junior Hafsah Alzamari, prevailed in a head-to-head matchup against junior Sydney Dao of Hoover High School. Alzamari, in her third year as a Key Club member, won over the crowd with her pledge to “ignite” the spirit in her division and promote interaction between the 10 different schools. Her platform calls for improvements in member education, teamwork, and networking, as well as inclusiveness — making sure everyone feels welcome within the organization. She served last year as the club secretary for Patrick Henry, and served the previous year as the club’s service chair. As service chair, she helped organize and oversee a year’s worth of community service projects, with PHHS Key Club members totaling more than 1,950 cumulative service hours in that span — personally accounting for an impressive 10 percent of that total. In addition, she also served this year as division secretary under 2018-19 Lt. Governor Ryan Lieng, also from Patrick Henry High School. Outside of Key Club, Hafsah has spent two years with the Patrick Henry Youth Orchestra and three years with the Model United Nations. As Lt. Governor, Alzamari will be responsible for the oversight of 10 different Key Clubs, covering an area ranging from La Jolla to Point Loma, then east to Mira Mesa, Scripps Ranch, Tierrasanta, and the Patrick Henry area. She will be required to turn in a monthly report updating the progress and accomplishments of these Key Clubs, and host a meeting each month for the student leaders under her care. 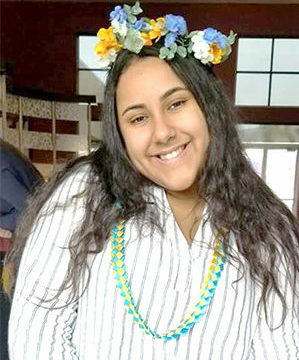 She will also sit on a panel of more than 90 student leaders representing the 45,000 Key Clubbers of the California-Nevada-Hawaii (Cali-Nev-Ha) Key Club District. There, she will be part of the decision-making process as the district board creates policies and directives for Key Club. She will serve on a committee with other student leaders and host leadership workshops for her peers. As a Key Club member at Patrick Henry, Hafsah has been exceptionally dedicated, attending dozens of service projects and every major leadership conference in the last three years. She will officially take office, taking over for Lieng, during the Cali-Nev-Ha Key Club District Convention in Ontario, California, April 12-14. Key Club International is the youth affiliate of Kiwanis International. Locally, the Patrick Henry High School Key Club is sponsored by the Kiwanis Club of Grantville-Allied Gardens. —John Crawford writes on behalf of the Grantville-Allied Gardens Kiwanis Club.